Ashingtonia 3 (5/6): 143 (1979), 1980. Habitat: It is found in mountainous areas at an altitude around 2500 m 3000 m over sea level. 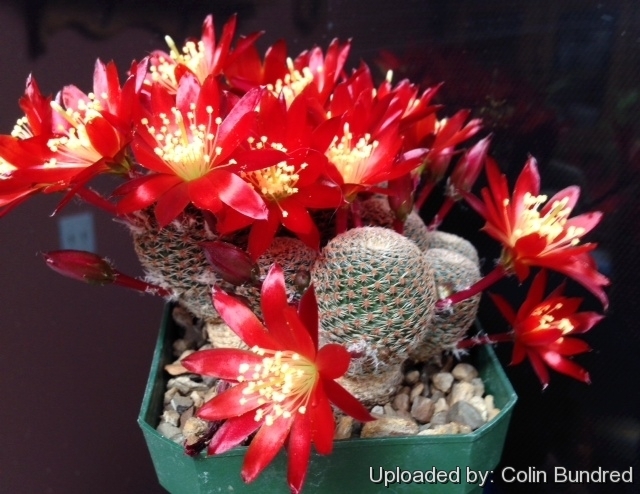 Description: Rebutia heliosa var. 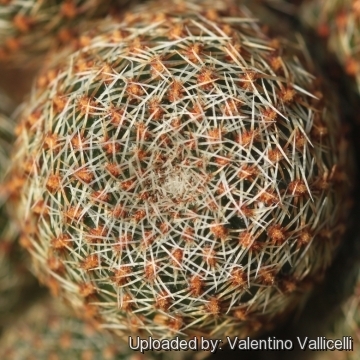 condorensis is a small clumping cactus with very short spines arranged on globes so that it looks like orbs covered with small, white spiders. It readily forms a clustering mound. 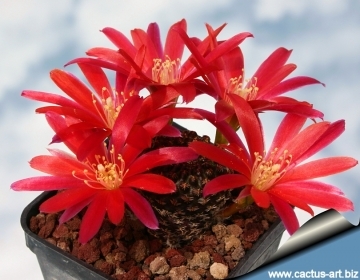 The variety “condorensis” specifically describes the clones of the species with dark red flowers, and larger heads. Stem: Deep green to brown , 3(-4) cm wide, rarely higher than 4 cm. 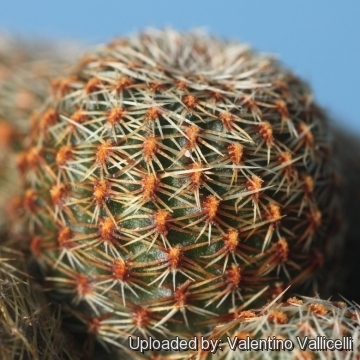 Spines: Very short, whitish to pale brown, spider-like. 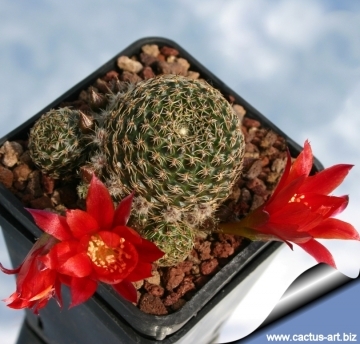 Blossoming time: Rebutia heliosa var. condorensis flowers profusely in spring. 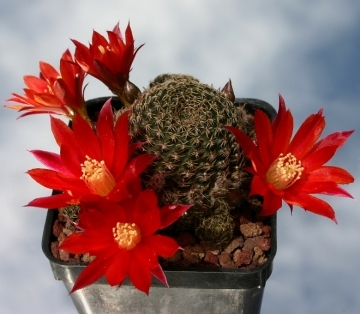 Notes: The R. helosa v. condorensis is very similar if not the same as Rebutia heliosa var. albopectinata. The only difference is the stigma colour, that is white in condorensis and pale green in albopectinata. Cultivation and Propagation: These small growing plants come from mountainous areas, so they like bright light, and cool and dry conditions in the winter. This is important for the flowers as well as for their health. Without this cool winter period (0-10° C) they normally won't get many buds. They have thick taproot and are of difficult cultivation, and rot prone because of a great sensitivity to excessive watering. It isn't easy to get them to grow to a large size on their own roots, and it's really a challenge to get them to grow into a large clump. 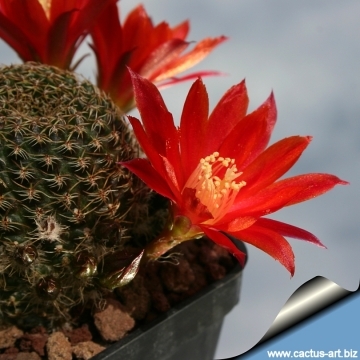 They are commonly grafted to avoid root problems, and to make easier to grow. Suited for bright exposure; but they can tolerate sunny exposure. Suited for airy exposures. 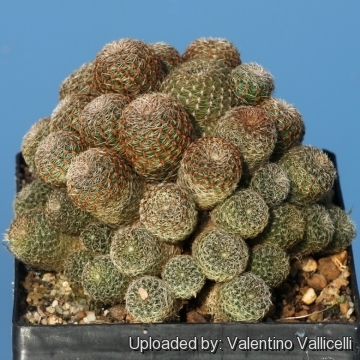 It is a small container-size plant and prefers a deep pot and good drainage to accommodate its tap root.. It will occupy a small pot comfortably and eventually remain a manageable sized house plant. It is very cold resistant to as low as to -10° C or less, for short periods of time. 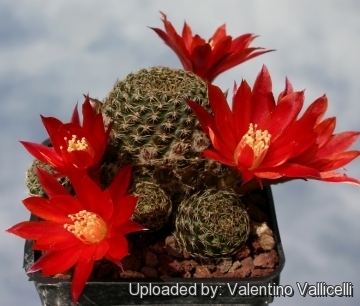 It is a fine plant for a rock garden or container, and contrasts well with agaves, yuccas, and low-growing flowering plants. This variety is also likely to flower as a house plant, but results will depend on a variety of growing conditions. Pests & diseases: R. heliosa It is especially prone to root rot, therefore, underpot in a smaller container filled with very porous compost. Propagation: By cuttings as it branches freely from the base; Also can be grown from seeds or graft. Seeds can be sown in the spring or summer. The seedlings should not be disturbed until they are well rooted, after which they can be planted separately in small pots.